If you have not yet been introduced to the joys of sheet pan dinners, you really need to get out that sheet pan and create this easy Sheet Pan Chicken Dinner. Roasted chicken thighs, small Yukon potatoes and tender fresh asparagus. Dinner on the table in thirty-minutes flat! What do you cook when you finally get home from a long day at work but still have to make a great dinner for the family? The kids are whiny, the husband is grumpy and everyone is hungry. All you want to do is sit down, put your feet up and relax. I’ve been there, done that. Many times! Bless the genius that got these sheet pan dinners going. This sheet pan chicken dinner is so easy. 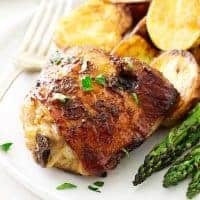 Glaze-brushed chicken thighs and oiled potatoes with a little seasoning are added to a sheet pan and popped into a hot oven. Just before the cooking time is up the oiled and seasoned asparagus is scattered on top for a quick roasting. Easy weeknight dinner fix, easy clean-up! And, if you line the sheet pan with foil and use a closable plastic bag to oil the veggies you save washing another dish. This dinner is delicious, healthy and diet friendly too. Everybody’s happy! You probably already have the standard half-sheet pan in your kitchen. It will measure 18-inches by 12-inches and have a one-inch rim. This is my favorite sheet pan but for just a small two-person dinner I use my 15 1/2-inch by 10 1/2 jelly-roll pan. Just about anything you choose will work here. Do you want salmon, halibut or cod for dinner? Go for it! 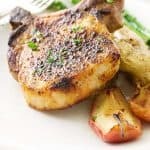 Pork chops are delicious. If you are in the mood for fajitas toss on slices of seasoned flank steak with onions and sweet peppers. Do a whole or split chicken surrounded with your favorite veggies. You can even roast up breaded fish or chicken and keep them crisp by adding them to a wire rack set over the tray of veggies. But then you will have two items to wash…the sheet pan and the rack! Line the sheet pan with foil and it’s still an easy clean-up. Try putting the dense veggies on the tray then when they have roasted enough, add the rack with the breaded items on top. Maybe some soft veggies on the rack with the quick-cooking breaded items? A breaded fish fillet will take less time to roast then thick, dense slices of potatoes and the rack is ideal. WHAT ARE THE BEST VEGETABLES TO ROAST? The best vegetables are the ones you love! Nearly all vegetables can be roasted. Determine which veggies need the longest roast time and add them first. The softer veggies will cook faster and should be tossed on after the more dense veggies have had some roasting time. Some of my personal favorites are carrots, potato chunks, butternut squash and especially parsnips. I had never been too keen on parsnips until I roasted them! So, try roasting some of the veggies that you are not too crazy about as you may find they have a new flavor. Roast up a batch of thick slices of sweet potatoes, small yellow onions, colorful bell peppers, and toss on a handful of cherry tomatoes. 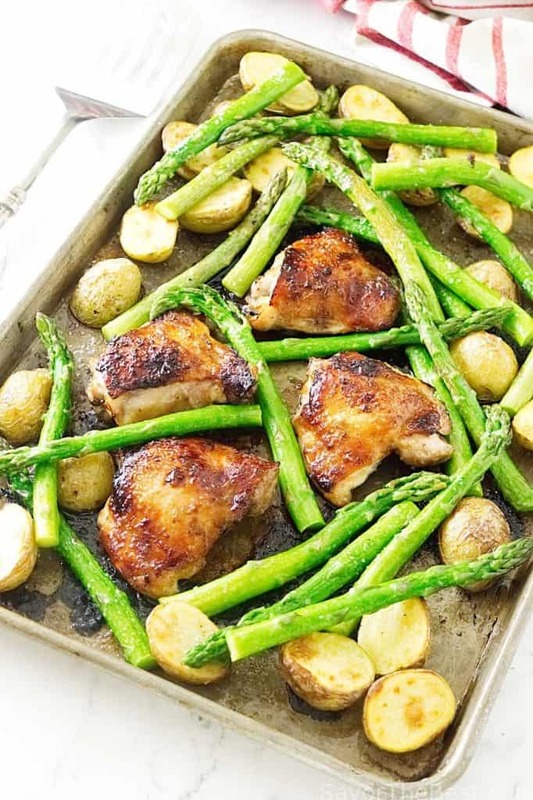 In our sheet pan chicken dinner, we chose small Yukon Gold potatoes, cut in half and fresh asparagus. A good rule of thumb is to toss two pounds of cut vegetables with one tablespoon of oil. It’s ok to use more though. Just be sure the veggies are all oiled up nicely. I am all for saving on dishwashing and in our recipe for sheet pan chicken dinner the potatoes went into a plastic bag with oil. The bag was closed and the bag massaged until the veggies have a coating of oil. The bag gets tossed out! No extra bowl to wash, no messy hands. Or, you could just put those veggies in a bowl, drizzle with oil and get your clean hands in there. Easy! Sheet Pan Chicken Dinner….On the table in 30 minutes! I roasted the potatoes and chicken for 20 minutes before adding the asparagus which roasted for just seven minutes. Normally, we like our roasted veggies with some yummy char on them, except for asparagus. We keep the roasting time shorter to have some crunch to them. The main thing to remember is to roast to your own likeness whether it be a light golden crunch or a dark char. This is a fast and easy dinner all in one pan. So, why not try this sheet pan chicken dinner tonight and make cooking week-night dinners great again! Try this easy Sheet Pan Chicken Dinner! 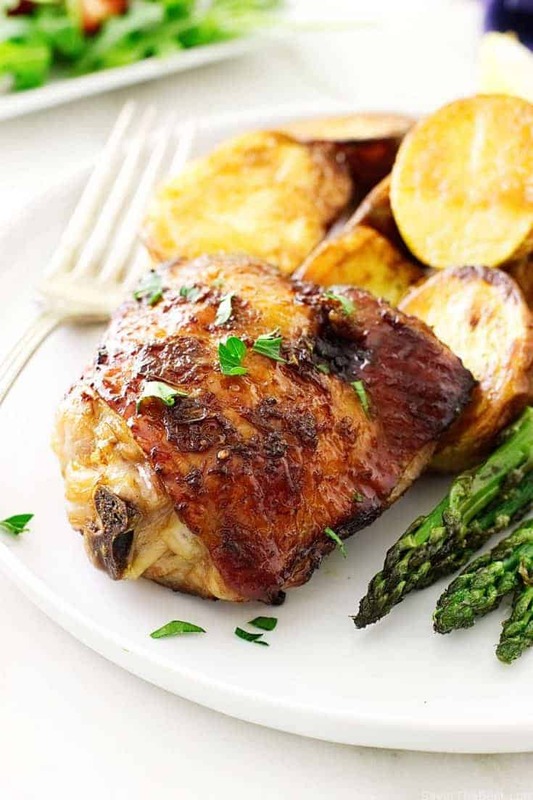 Roasted chicken thighs, small Yukon potatoes and tender fresh asparagus. Dinner on the table in thirty-minutes flat! In a small dish whisk together the soy sauce, honey, garlic and ginger. Dip the chicken thighs into the dish of glaze, coating each side, allow excess to drip off then arrange them on one end of the sheet pan. In a closable plastic bag add the potatoes, close the bag. Rub the potatoes to coat each one, then arrange them on the other end of the sheet pan, cut side down. Add the asparagus to the same bag with the oil, coating them well. Remove the asparagus and reserve on a plate. Sprinkle salt and pepper on the potatoes and the chicken. Transfer the sheet pan to the middle rack of the oven and roast for 25 minutes. Remove the sheet pan from the oven and add the asparagus spears. It’s ok if they are on top of the chicken and veggies. Transfer from the oven and serve. This is one of the best chickens I have ever enjoyed. This sheet pan recipe is a must-try for everyone. We’re actually planning to make another one this weekend. Thank you for sharing this recipe. Sheila….I am thrilled that you enjoyed this recipe! 🙂 It is also great with salmon! Thanks for replying to us as it is always good to hear from our readers. 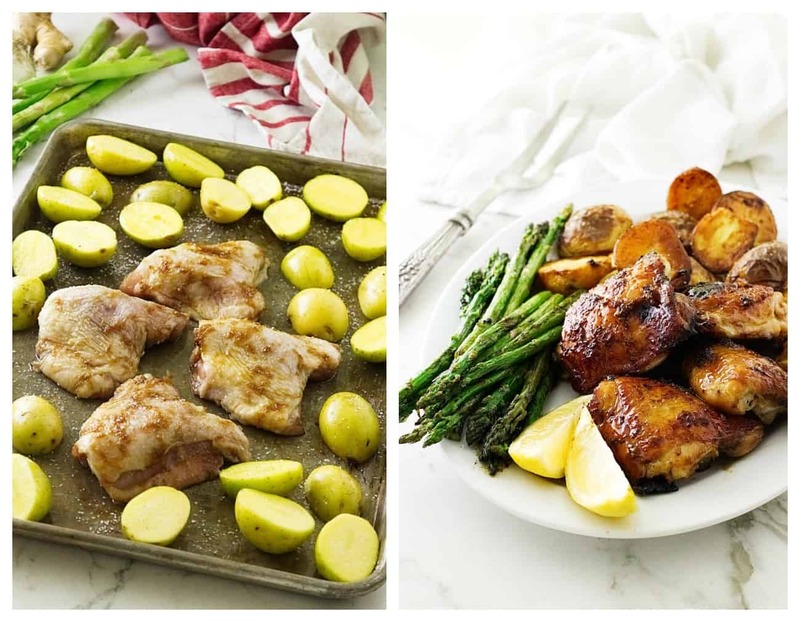 I love sheet pan dinners – this chicken dinner looks totally mouthwatering! Anything that can be done in one pan is good with me! This looks delicious and hearty autumn comfort food. Thanks, Danielle! This is a great time-saver and tastes wonderful! That sounds wonderful, it is such a great simple way of cooking, perfect for midweek laziness. Hi, Brian! 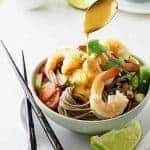 So easy, so delicious, I’m hooked! 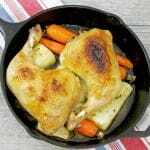 Fantastic recipe, this sheet pan chicken can actually be any sheet pan dinner. Sheet pan dinners are so easy! And they can be excellent. This is a good example of that — super flavors, and they all go together so well. Roast veggies are always so terrific,, aren’t they? Good stuff — thanks. John, you are so right! I have been doing sheet pan dinners more frequently and I love how easy and delicious they are. So many varieties!